Two McGillians have been selected as Schwarzman Scholars, a one-year Masters’ program in Global Affairs. Grad Jordan-Nicolas Matte and soon-to-be-alum Jonathan Lopez Naranjo will join an elite cohort of international scholars at Beijing’s Tsinghua University in August 2018. 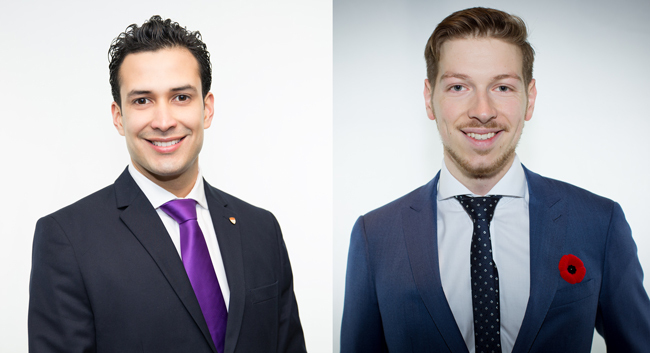 Jonathan Lopez Naranjo (left) and Jordan-Nicolas Matte are recent recipients of Schwarzman Scholarships which will allow them to pursue a one-year Masters’ programs in Global Affairs at Beijing’s Tsinghua University. On December 4, 2017, the Schwarzman Scholars program announced its third cohort, which includes one McGill grad and one soon-to-be grad. Next August, Jordan-Nicolas Matte (BA’15) and Jonathan Lopez Naranjo (BA’18) will begin one-year Masters’ programs in Global Affairs at Beijing’s Tsinghua University. More than 4,000 candidates from around the world competed for 142 scholarships. Matte and Lopez Naranjo are the first McGillians accepted into the program. (Matte was accepted into last year’s cohort, but deferred.) The scholars will live and study together at Schwarzman College, a LEED gold-certified facility at Tsinghua University. Scholars are chosen based on academic achievement, as well as leadership potential and strength of character. Inspired by the Rhodes Scholarships, Stephen A. Schwarzman founded the Scholars three years ago, with an aim to promote international understanding and peace. Schwarzman is the CEO of the Blackstone Group, a global private equity firm. The grandson of war refugees from Romania, Montrealer Jordan-Nicolas Matte holds a first class honors degree in Political Science, with a minor in Hispanic Languages. “Ever since I started reading books, I have always been passionate about international relations, travels and different cultures,” he wrote in an essay about his experiences interning at the Canadian Embassy in Washington, D.C. “With time, this passion has extended to history and political economics as well, as I am confident these are crucial subjects to understand in order to be a good citizen.” Matte is currently a Chevening Scholar at the University of Oxford, where he is completing a Master in Public Policy. He has served in the Canadian Armed Forces and worked in the Parliament of Canada. In addition to studying a core curriculum—developed by academics from Harvard, Oxford, Princeton, Stanford, Tsinghua and Yale—each Schwarzman Scholar will specialize in one of three academic disciplines: public policy, economics and business, or international studies. The program also promotes cultural immersion, offering the students travel opportunities to help them develop their understanding of contemporary China.